Commission Decision 20XX/2005/EC (5) repeals certain Decisions implementing measures provided for in the Directives repealed by Directive 2004/41/EC of the European Parliament and of the Council of 21 April 2004 repealing certain Directives concerning food hygiene and health conditions for the production and placing on the market of certain products of animal origin intended for human consumption and amending Council Directives 89/662/EEC and 92/118/EEC and Council Decision 95/408/EC (6). Certain parts of the relevant Decisions should therefore be retained in this Regulation. Flexibility is needed so foods with traditional characteristics can continue to be produced. Member States have already granted derogations for a wide range of such foods under the legislation in force before 1 January 2006. Food business operators should be able to continue without interruption to apply existing practices after that date. A procedure allowing Member States to exercise flexibility is provided for in Regulations (EC) No 852/2004, (EC) No 853/2004 and (EC) No 854/ 2004. However, in most cases where derogations have already been granted it is only a question of continuing established practices, so applying a full notification procedure, including a complete hazard analysis, may place an unnecessary and disproportionate burden on the Member States. Foods with traditional characteristics should therefore be defined and general conditions applicable to such foods should be laid down, by way of derogation from the structural requirements laid down in Regulation (EC) No 852/2004, with due regard to food health objectives. Scientific progress has led to the establishment of ISO 16649-3 as an agreed reference method for analysis of E. coli in bivalve molluscs. This reference method is already established for live bivalve molluscs from areas A in accordance with Commission Regulation (EC) No 2073/2005 on microbiological criteria for foodstuffs (7). Consequently, ISO 16649-3 should be specified as the reference MPN (most probable number) method for analysis of E. coli in bivalve molluscs originating in areas B and C too. The use of alternative methods should be allowed only where they are considered equivalent to the reference method. 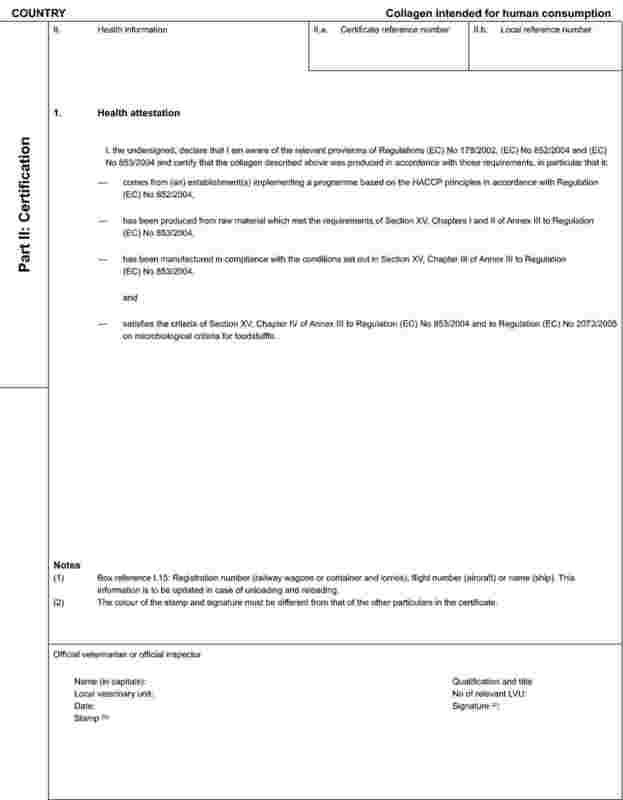 The model health certificates for imports of frogs' legs, snails, gelatine and collagen as referred to in Article 6(1)(d) of Regulation (EC) No 853/2004 and of raw materials for the production of gelatine and collagen are as set out in Annex VI to this Regulation. protected as traditional food products by a Community, national, regional or local law. Chapter II(1)(f) and Chapter V(1) of Annex II to Regulation (EC) No 852/2004 as regards the type of materials of which the instruments and the equipment used specifically for the preparation, packaging and wrapping of these products are made. (1) OJ L 139, 30.4.2004, p. 1. Corrected by OJ L 226, 25.6.2004, p. 3. (2) OJ L 139, 30.4.2004, p. 55. Corrected by OJ L 226, 25.6.2004, p. 22. (3) OJ L 139, 30.4.2004, p. 206. Corrected by OJ L 226, 25.6.2004, p. 83. (4) OJ L 165, 30.4.2004, p. 1. Corrected by OJ L 191, 28.5.2004, p. 1. (6) OJ L 157, 30.4.2004, p. 33. Corrected by OJ L 195, 2.6.2004, p. 12. The competent authority at the place of dispatch shall inform the dispatching food business operator of the minimum elements of food chain information to be supplied to the slaughterhouse in accordance with Section III of Annex II to Regulation (EC) No 853/2004. feedback of relevant information to the holding, if applicable, is provided. Where animals are dispatched for slaughter to another Member State, the competent authorities at the place of dispatch and the place of slaughter shall cooperate to ensure that the information provided by the dispatching food business operator is easily accessible to the slaughterhouse operator receiving it. 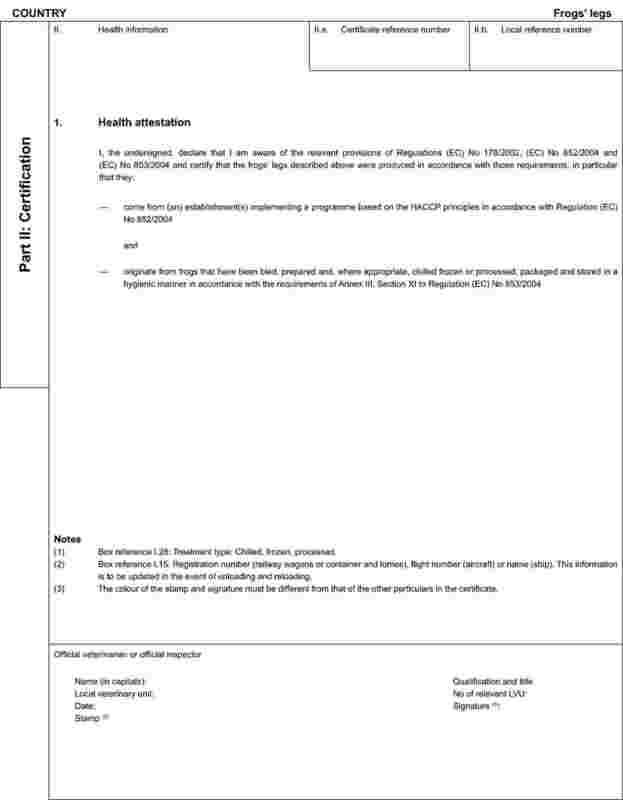 The official veterinarian may use the model document laid down in Appendix I for the relevant inspection results that must be communicated to the holding where the animals were raised before slaughter in the same Member State in accordance with Chapter I of Section II of Annex I to Regulation (EC) No 854/2004. The competent authority is responsible for communicating the relevant inspection results in cases where the animals are raised on a holding in another Member State and must use a version of the model document laid down in the Appendix in both the language of the dispatching country and the language of the recipient country. ‘Visible parasite’ means a parasite or a group of parasites which has a dimension, colour or texture which is clearly distinguishable from fish tissues. ‘Visual inspection’ means non-destructive examination of fish or fishery products with or without optical means of magnifying and under good light conditions for human vision, including, if necessary, candling. ‘Candling’ means, in respect of flat fish or fish fillets, holding up fish to a light in a darkened room to detect parasites. in the case of mechanical evisceration, by sampling carried out on a representative number of samples being not less than 10 fish per batch. The visual inspection of fish fillets or fish slices must be carried out by qualified persons during trimming and after filleting or slicing. 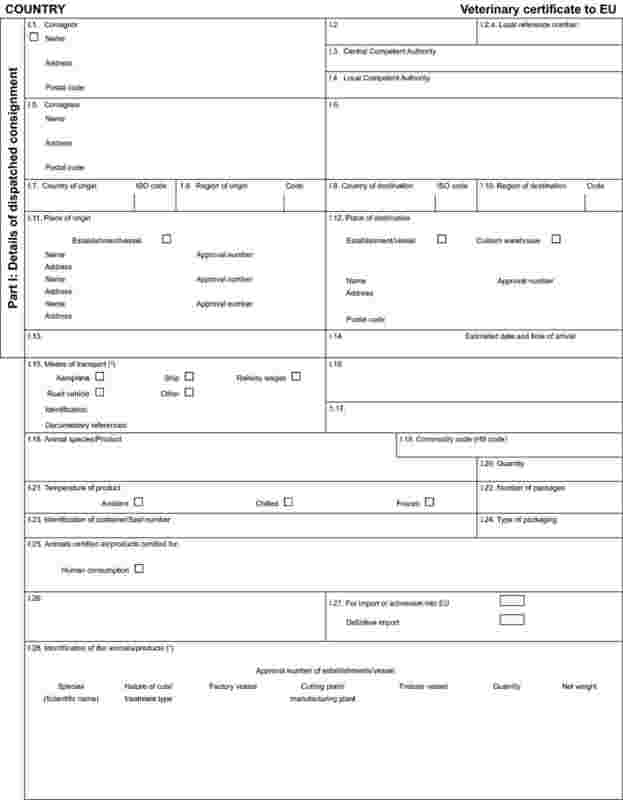 Where an individual examination is not possible because of the size of the fillets or the filleting operations, a sampling plan must be drawn up and kept available for the competent authority in accordance with Chapter II(4) of Section VIII of Annex III to Regulation (EC) No 853/2004. Where candling of fillets is necessary from a technical viewpoint, it must be included in the sampling plan. 35 mg of nitrogen/100 g of flesh for the species referred to in point 3 of Chapter II. The reference method to be used for checking the TVB-N limit involves distilling an extract deproteinised by perchloric acid as set out in Chapter III. Distillation as referred to in point 1 must be performed using apparatus which complies with the diagram in Chapter IV. 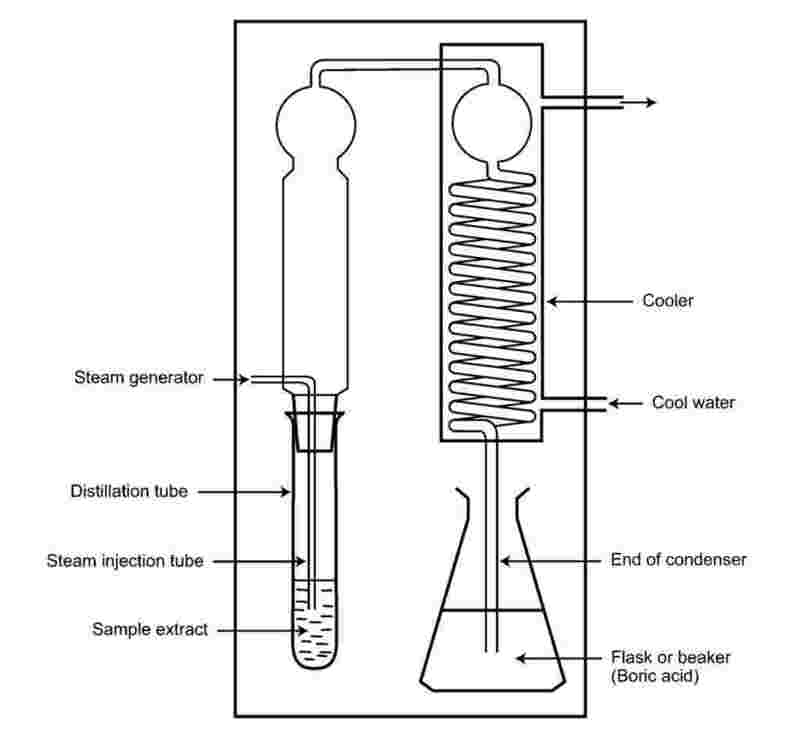 distillation of an extract deproteinised by trichloracetic acid (Codex Alimentarius Committee on Fish and Fishery Products (1968). The sample must consist of about 100 g of flesh, taken from at least three different points and mixed together by grinding. Species belonging to the Pleuronectidae family (with the exception of halibut: Hippoglossus spp.). Salmo salar, species belonging to the Merlucciidae family, species belonging to the Gadidae family. indicator solution (Tashiro Mixed Indicator) 2 g methyl-red and 1 g methylene-blue are dissolved in 1 000 ml 95 % ethanol. A meat grinder to produce a sufficiently homogenous fish mince. High-speed blender with a speed of between 8 000 and 45 000 revolutions/min. Fluted filter, diameter 150 mm, quick-filtering. Burette, 5 ml, graduated to 0,01 ml. Apparatus for steam distillation. The apparatus must be able to regulate various amounts of steam and produce a constant amount of steam over a given period of time. It must ensure that during the addition of alkalising substances the resulting free bases cannot escape. The sample to be analysed should be ground carefully using a meat grinder as described in point 5(a). Exactly 10 g 0,1 g of the ground sample is weighed out into a suitable container. This is mixed with 90,0 ml perchloric acid solution as specified in point 4(a), homogenised for two minutes with a blender as described in point 5(b), and then filtered. The pH of the end point should be 5,00,1. Duplicate analyses are required. The applied method is correct if the difference between duplicates is not greater than 2 mg/100 g.
Check the equipment by distilling solutions of NH4Cl equivalent to 50 mg TVB-N/100 g.
Standard deviation of reproducibility Sr = 1,20 mg/100 g. Standard deviation of comparability SR = 2,50mg/100 g.
In accordance with Article 7(2) and (3) of Council Directive 86/609/EEC (1), elements of replacement, refinement and reduction must be taken into account when biological methods are used. The paralytic shellfish poison (PSP) content of edible parts of molluscs (the whole body or any part edible separately) must be detected in accordance with the biological testing method or any other internationally recognised method. The biological testing method may be carried out in association, if necessary, with another method for detecting Saxitoxin and any of its analogues for which standards are available. If the results are challenged, the reference method shall be the biological method. The total content of amnesic shellfish poison (ASP) of edible parts of molluscs (the entire body or any part edible separately) must be detected using the high-performance liquid chromatography (HPLC) method or any other recognised method. A series of mouse bioassay procedures, differing in the test portion (hepatopancreas or whole body) and in the solvents used for extraction and purification, may be used for detecting marine toxins as referred to in Chapter V(2)(c), (d) and (e) of Section VII of Annex III, to Regulation (EC) No 853/2004. Sensitivity and selectivity depend on the choice of solvents used for extraction and purification and this should be taken into account when a decision is made on the method to be used in order to cover the full range of toxins. A single mouse bioassay involving acetone extraction may be used to detect okadaic acid, dinophysistoxins, pectenotoxins and yessotoxins. This assay may be supplemented, if necessary, with liquid/liquid partition steps with ethyl acetate/water or dichloromethane/water to remove potential interferences. Azaspiracid detection at regulatory levels by means of this procedure shall involve the use of the whole body as the test portion. azaspiracids: AZA1, AZA2 and AZA3. If new analogues of public health significance are discovered, they should be included in the analysis. Standards must be available before chemical analysis is possible. Total toxicity shall be calculated using conversion factors based on the toxicity data available for each toxin. The performance characteristics of these methods shall be defined after validation following an internationally agreed protocol. Biological methods shall be replaced by alternative detection methods as soon as reference materials for detecting the toxins prescribed in Chapter V of Section VI of Annex III to Regulation (EC) No 853/2004 are readily available, the methods have been validated and this Chapter has been amended accordingly. (1) OJ L 358, 18.12.1986, p. 1.
be determined by a standardised international method. Each Member State shall provide the Commission with a linking address to a single national website containing the masterlist of lists of approved food establishments for products of animal origin as defined in point 8(1) of Annex I to Regulation (EC) No 853/2004. 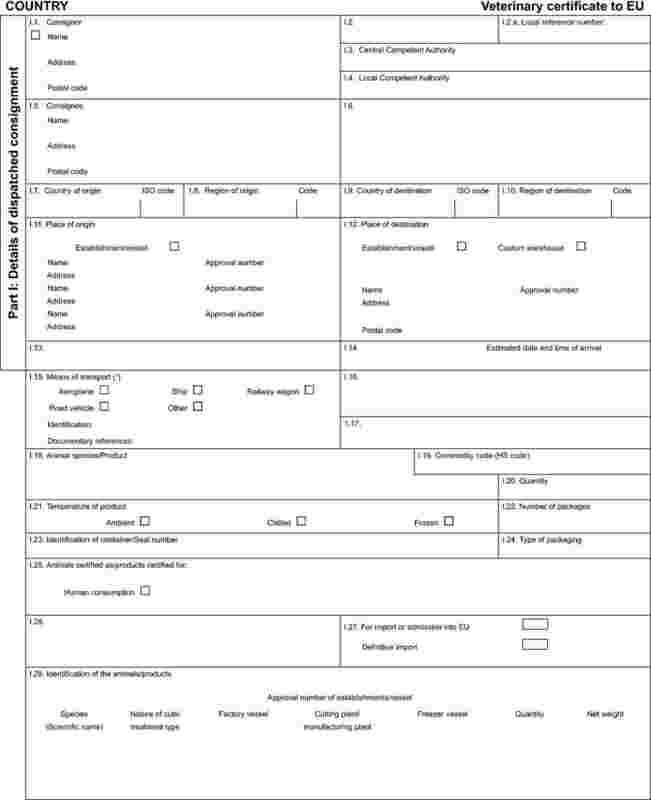 The masterlist referred to in point 1 shall consist of one sheet and shall be completed in one or more official languages of the Community. The website containing the masterlist shall be developed by the competent authority or, where appropriate, one of the competent authorities referred to in Article 4 of Regulation (EC) No 882/2004. where certain lists of approved food establishments are not maintained by the competent authority referred to in point 1, websites managed by other competent authorities, units or where appropriate, bodies. 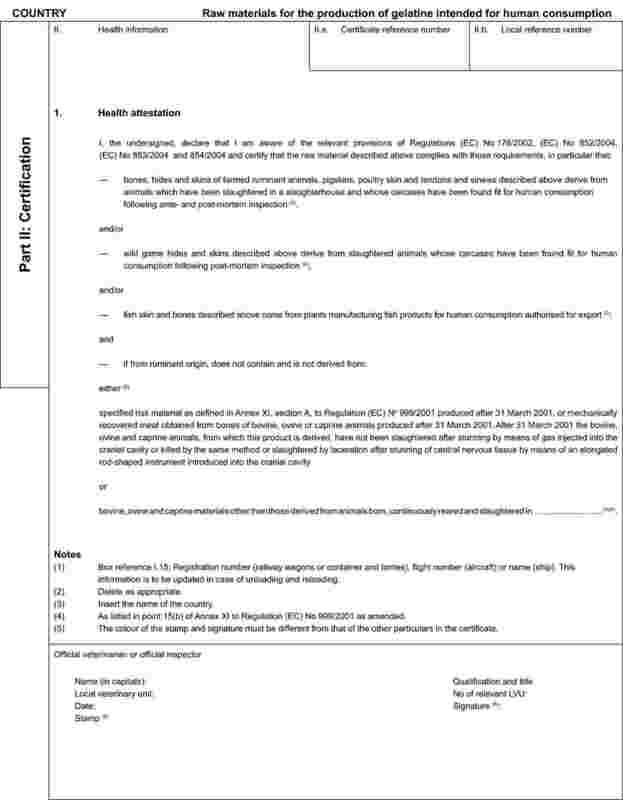 Health certificates as referred to in Article 6(1)(d) of Regulation (EC) No 853/2004 for imports of frogs' legs and snails shall comply with the models laid down respectively in Part A and Part B of Appendix I to this Annex. 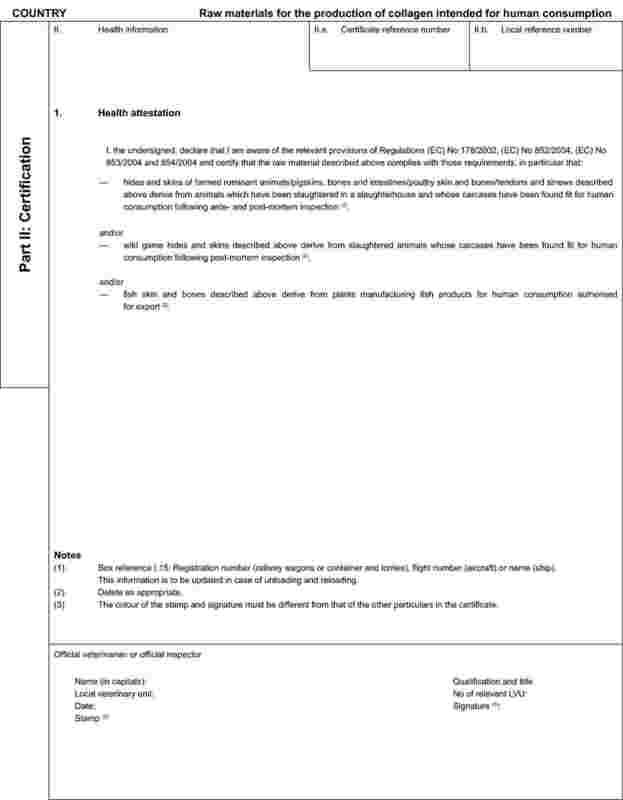 Without prejudice to other specific Community legislation, at least including but not limited to legislation on transmissible spongiform encephalopathies and hormones, health certificates as referred to in Article 6(1)(d) of Regulation (EC) No 853/2004 for imports of gelatine and raw materials for the production of gelatine shall comply with the models laid down respectively in Part A and Part B of Appendix II to this Annex. 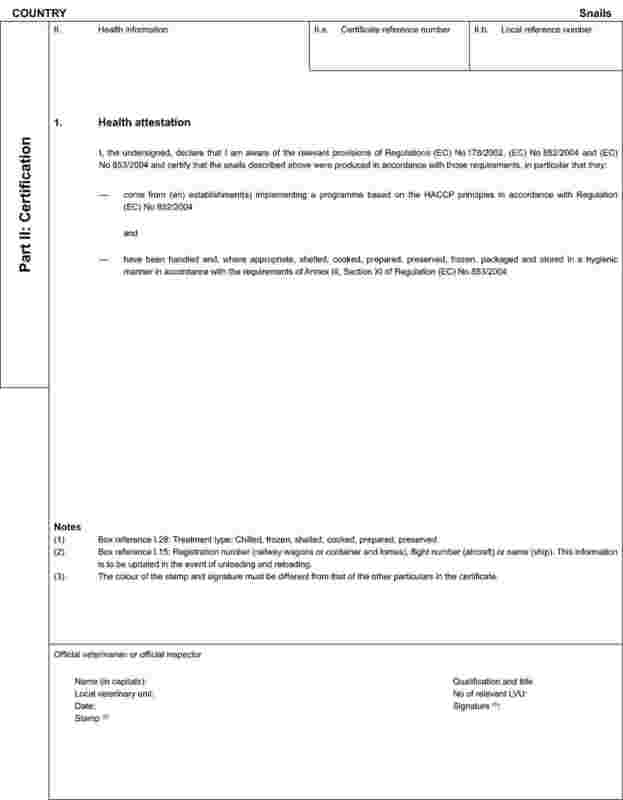 Without prejudice to other specific Community legislation, at least including but not limited to legislation on transmissible spongiform encephalopathies and hormones, health certificates as referred to in Article 6(1)(d) of Regulation (EC) No 853/2004 for imports of collagen and raw materials for the production of collagen shall comply with the models laid down respectively in Part A and Part B of Appendix III to this Annex. 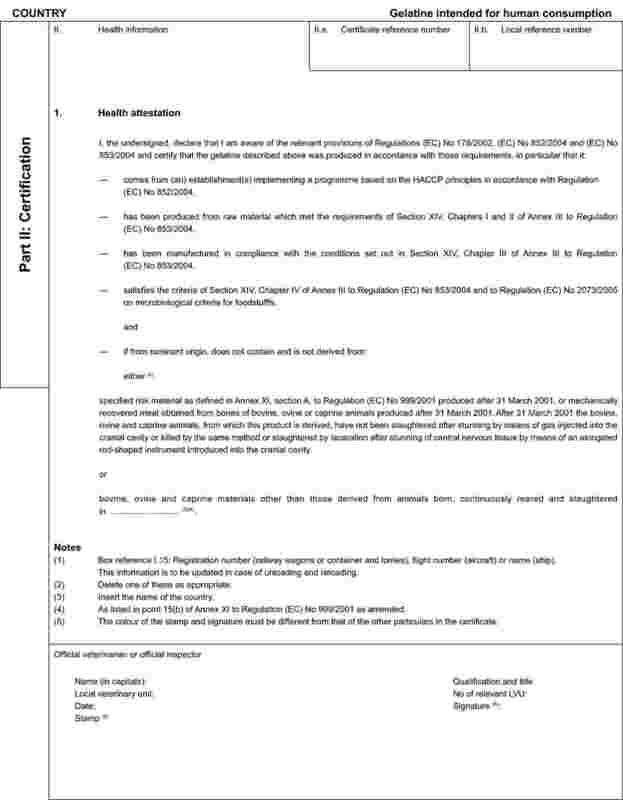 that teat dips or sprays are used only after authorisation or registration in accordance with the procedures laid down in Directive 98/8/EC of the European Parliament and of the Council of 16 February 1998 concerning the placing of biocidal products on the market (1). 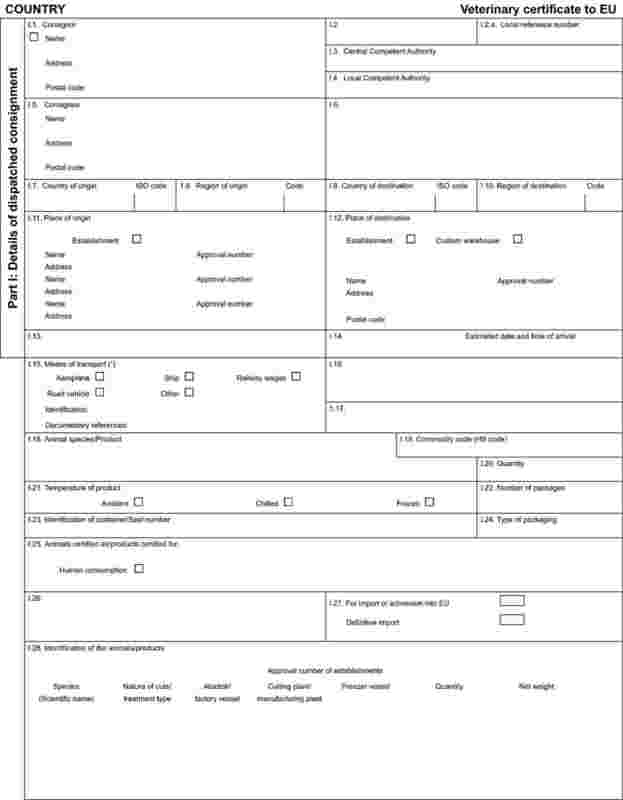 The competent authority may classify as being of Class B areas from which live bivalve molluscs may be collected and only placed on the market for human consumption after treatment in a purification centre or after relaying so as to meet the health standards referred to in paragraph 3. Live bivalve molluscs from these areas must not exceed 4 600E. coli per 100 g of flesh and intravalvular liquid. The reference method for this analysis is the five-tube, three dilution Most Probable Number (MPN) test specified in ISO 16649-3. Alternative methods may be used if they are validated against this reference method in accordance with the criteria in EN/ISO 16140.